Apple’s iPhone is the star of a new European Union examination that looks into the iPhone contracts carriers in the region sign for “possible antitrust violations,“ The New York Times reveals. “We have been contacted by industry participants and we are monitoring the situation, but no antitrust case has been opened,” said Antoine Colombani, a spokesman for Joaquín Almunia, competition commissioner of the European Union. People briefed on the carriers’ relationships with Apple, who declined to be named because Apple does not permit them to speak publicly about the contracts, said the terms that some European carriers must accept to sell iPhones are unusually strict, making it difficult for other handset makers to compete. At the same time, Apple doesn’t force carriers to sign a deal for the iPhone, but no mobile operator can afford not to have the device in stock because of its still huge popularity with buyers – that’s even if Apple isn’t topping the European mobile landscape when it comes to smartphone OS market share. But some of Apple’s competitors complain that the big purchases Apple requires from carriers strongly pressure them to devote most of their marketing budgets to the iPhone, leaving little money to promote competing devices, said an executive at one of Apple’s rivals, who declined to be named to avoid jeopardizing carrier relationships. That sounds like a real issue, but then again, just walk into plenty of European carrier stores and see for yourself how much real estate Android smartphones and other devices get compared to the iPhone. The same goes for carrier ads and for their online stores where the iPhone doesn’t get a constantly prominent placement. Unofficially, we’ve also heard plenty of times about carrier internal directives to push anything but iPhones, and, if true, that’s certainly an interesting stance on iPhone sales from mobile operators, especially considering that they have to accomplish a certain sales goal over three years. That’s not to say that Apple doesn’t indeed have a strong arm when negotiating contracts with mobile operators, and that’s not to say that some carriers find it hard to agree to such contracts. But it’s going to be a hard job to prove that Apple is engaged in antitrust violations in a market where it doesn’t happen to own in terms of market share, and most reports and analyses of the European market point to Android as the top mobile OS in Europe. At the end of the day, more European smartphone buyers choose other mobile operating systems, with most of them going for an Android device. And that’s despite any pressure iPhone sales contracts put on carriers. 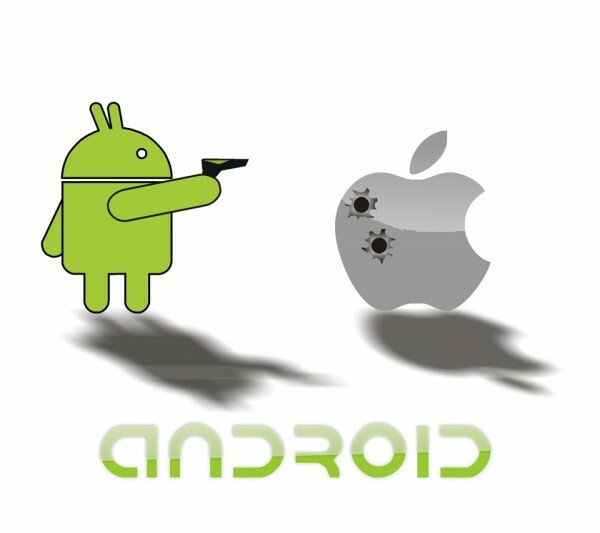 If anything, Apple’s way of negotiating with carriers should be adopted by more Android OEMs. That would reduce carrier control over upcoming handsets, from product names and design to pre-installed bloatware and timely Android updates. Starting with the Galaxy S3, Samsung has finally been able to launch generally the same flagship handset version in multiple markets. It did not have to change the name of the product to meet the needs of carriers, nor did it have to change the design of the phone or the internal hardware for them. Sure, there were different Galaxy S3 versions when it comes to processor choice, but that was determined by the need to support LTE in a certain market. However, the overall design, specs and product name remained unchanged no matter what market you’d look for the Galaxy S3 in. HTC has also started to learn from Apple and Samsung. Its recently announced HTC One will be sold as the One by AT&T, Sprint and T-Mobile in the USA, and will likely sport the same design and internal components. Verizon was said to get a custom HTC One version – one that will sell under a custom brand – but HTC quickly put rumors to rest by announcing via Twitter that the HTC One isn’g going to Verizon. It remains to be seen whether an HTC One version will hit Verizon under a different name or not. Google has carrier problems of its own, which it will hopefully solve in the future. The LG Nexus 4 came without LTE support at a time when carriers and OEMs were pushing more and more LTE-ready devices, and it was speculated that Google’s inability to negotiate with carriers was one of the reasons why the phone lacks 4G LTE support. A new set of rumors claims that the future X Phone will also be sold online, possibly from the Play Store, with Google also bypassing carriers when it comes to software updates, although we’ll cross that bridge when we get there. But Nokia was the clear leader of the mobile market, both by sales and market share back then. What will the EU do with Apple? The NYT isn’t able to reveal what the European Commission’s course of action will be in this particular examination. European regulators will probably review the case and determine whether it’s worthy of a formal inquiry. Meetings with the “aggrieved companies” are apparently also in order in such cases, and we can expect to see more details on this potential antitrust investigation targeting Apple in the future. In case this becomes a formal investigation, the worst case scenario for Apple being found guilty of antitrust practices would be to pay a fine of up to 10% of the company’s most recent annual sales. It’s worth pointing out that the EU has started formal investigations targeting Motorola and Samsung for their FRAND patent use in various cases in the region against competitors such as Apple and Microsoft. The EU is also investigating Google for its search business and has looked into its privacy policies, and has targeted other large tech companies in the past including Microsoft and Intel. Will Apple be next?